I won a quart of fresh Georgia pecans in an auction on my mom’s board and have been looking around for recipes using pecans. 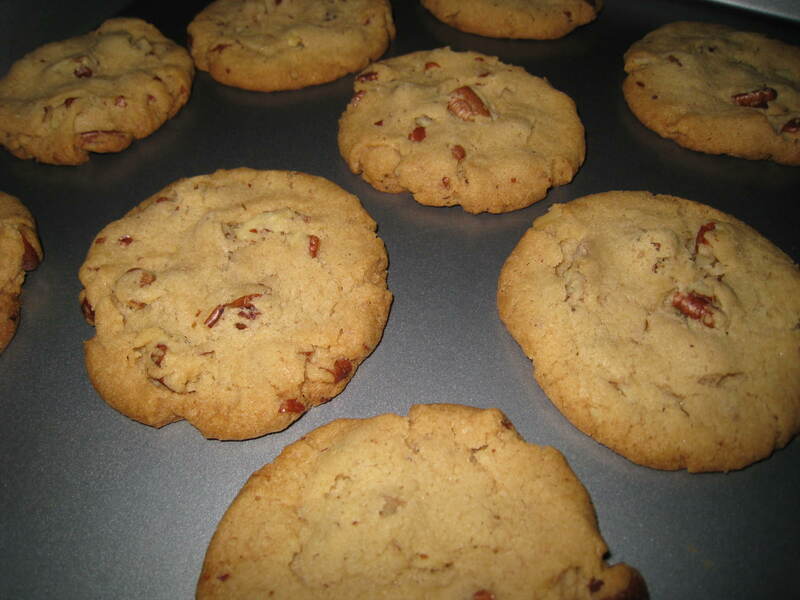 I love Keebler’s Pecan Sandies and these were even better – a little more crispy and packed full of pecans! Preheat oven to 350 degrees with racks in upper and lower thirds. In a large bowl, using an electric mixer, beat butter and sugar until light and fluffy. Beat in vanilla and salt. With mixer on low, gradually add in flour, beating just until combined. Fold in pecans. Roll dough into 1 1/2 inch balls and place on two baking sheets, 2 inches apart. With a dampened bottom of a glass, lightly flatten each ball. Bake until cookies are golden brown, 15 to 17 minutes, rotating sheets halfway through. Transfer to wire racks and let cool. Store in an airtight container.